1. 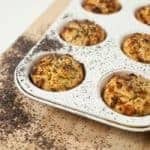 Mix the dry ingredients in a larger bowl, add the eggs, zest and squeeze the lemons, add the juice and the zest and pour the batter in the muffin cases. 2. Preheat the oven to 180 °C/350 °F and bake for 20-25 minutes or until golden brown.